I may not be artsy, but I try…. Last year, our old team in Kentucky traveled to a friend’s lake house for a staff retreat and while there, we took a self-assessment test named “The Call” that was way in depth (it took hours to complete), but it was really accurate and not only told you more about how you worked and functioned, but also how your team did, so you understood more about how you fit together. It also told you what career you would enjoy based on your “fit”. One of the things that I learned about myself through this was that I love balancing a lot of plates at once. If you are feeling overwhelmed with all that you are doing and need to hand some of it off, I am the girl for you. I think I get this honest because both my mom and dad function this way. The man that gave us the assessment made the comment that, for me, if I didn’t have multiple plates to juggle, I would find things to do. How true this was!! Here in NC, people have freed me up to not have lots of responsibility so I can transition to the area, a new team, etc. While I am grateful for this, I am finding that I have less and less plates to juggle. So, like the man said, I have found things to do. 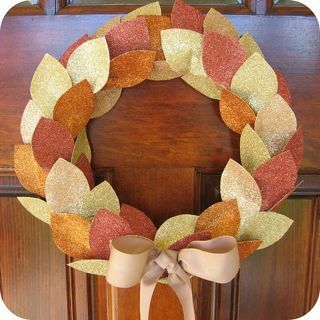 This week, that has turned into arts and crafts, especially since Pininterest (which is WAY addicting) has given me creative things to get excited about. 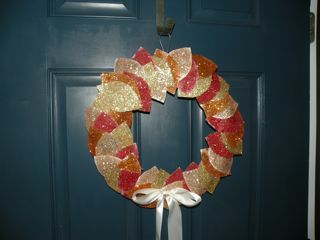 I made this wreath for our front door, complete with fall colors. The first one is the one I made, the second one is the template I created it from. The template looks better, but mine is not bad for the first go round. Ed isn’t too happy about all the glitter that still remains a week after the project!! 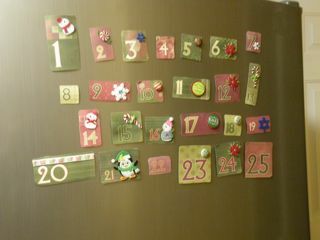 The next thing I did was made an advent calender for our fridge for Christmas. I know it is early, but I had all the supplies from last year and decided just to do it so it would be ready for this year. On the back of each number will be an activity that our family will do each of the days before Christmas. In other news, we have a pacifier-free child!! She did way better than I thought she would getting rid of it. We cut it down little by little and by the end, she was throwing it out of the crib and refusing to take it from us. The next challenge will be potty training. Bring it on! !